From the beginning of this project, we have been discussing Survival V. Extinction. We've also spent a considerable amount of time discussing animal life cycles. Thinking about the Trout (remember our field trip? If not, the booklet is below), it is now time to create a game that will either help a Trout survive one of it's life cycles... Or, if you're feeling sinister, you can create a game where you take on the role of a predator or pollutant... It is entirely up to you! Using the form below, answer the questions and create a plan for your game. Remember to always simplify! If you go too big, it will be very difficult to complete this task. Enjoy and work together... We are much, much better as a team! Follow this link to access your Bow Habitat book and review the stages of the Trout's life cycle! Hey Crew! Are you ready for module 4? The best part about coding, is that by changing just one or two numbers, you can seriously change the way the program works! By changing that one, single, small number into something bigger... some different, crazy things start to happen to your program. What do you think will happen here? Part 1: Enter the code below into Scratch. What numbers can you change? What other codes can you add? (Think sounds, for example). CHANGE EVERYTHING once you've built the code! Part 2: How'd it go? After you built everything did you change the number of steps? What your sprite says? How long they say it for? Below is another set of code. Copy this into your work space, and CHANGE EVERYTHING again! (That's all in caps because we're yelling the excitement at you!). 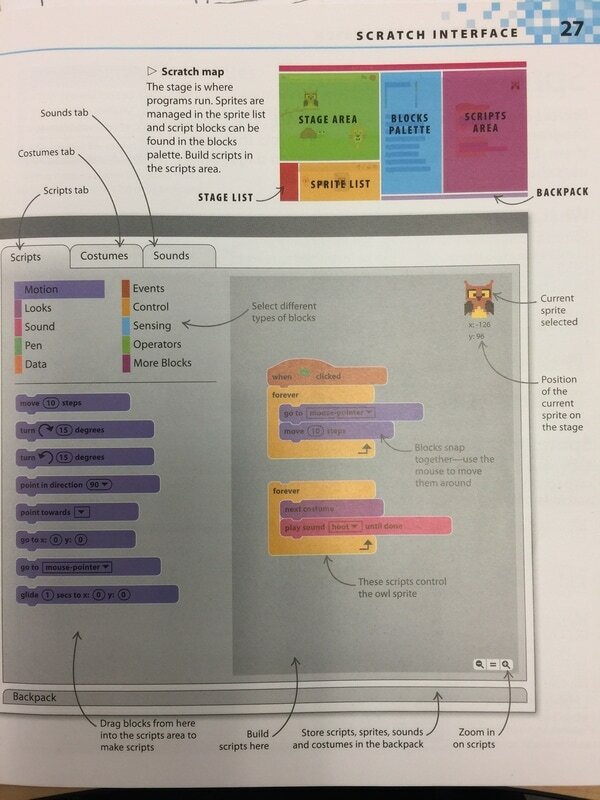 Scratch is one of many programming languages. We'll use it in our Survival and Extinction game connected to Fish Creek Park. Step 1: Create a Scratch account. You will need your Gmail address for this. Click on the Scratch link above and follow the steps to create an account. Step 2: Under the CREATE section of Scratch try out every button. Can you figure out what every button does? 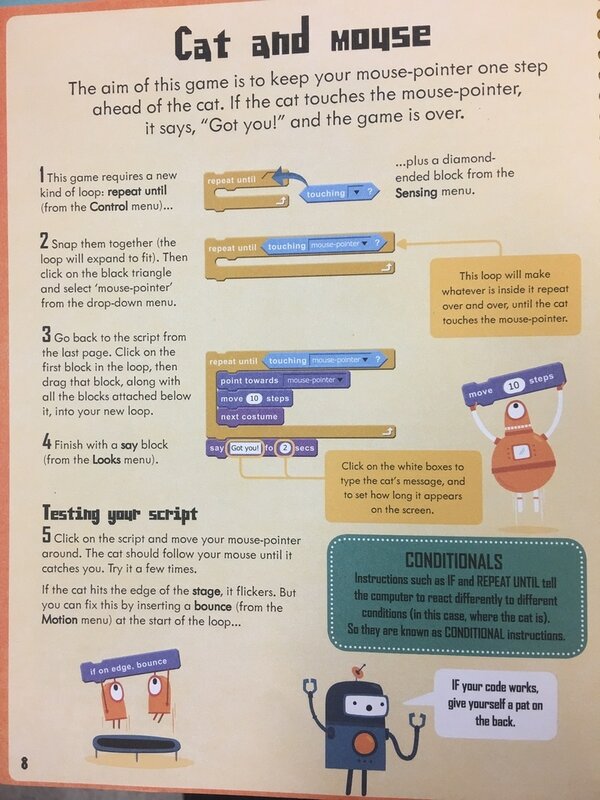 If you need some hints, the photos below can help you understand the Scratch world, Sprites and colored blocks and scripts. 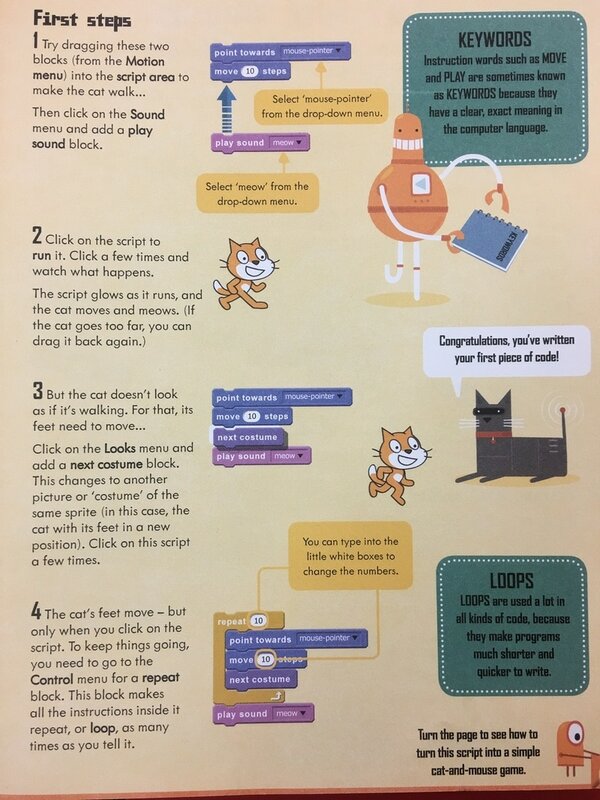 Step 3: Show someone everything you've learned about Scratch. What did you miss that someone can help you with? 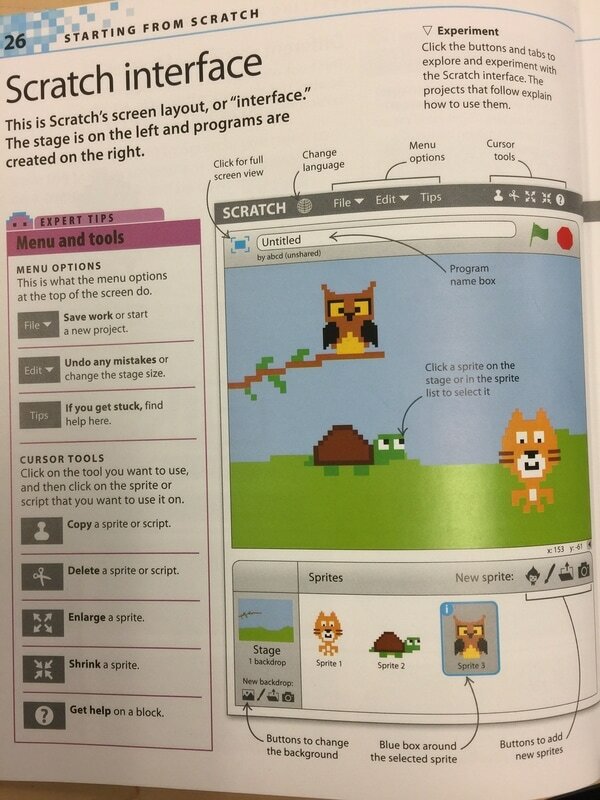 Step 4: Explore the Scratch website. ​What would you do if I said walk straight, turn right? Well... You'd probably just walk straight and take a right at the door! Robots, though, just don't get it. They'd walk straight for 1 step, turn right, and stare at a wall. Worse yet, if you told them to walk straight, turn right, and walk straight again, they'd just walk straight into the wall! And they'd crash right through it if you didn't tell them not to. Step 1 - ​Read the orange chart above and get ready to learn about speaking to computers in their language. Watch the video about writing instructions or algorithms HERE. Step 2 - Graph paper programming. Look at the symbols and images on this PAGE (make sure to scroll down to the 3rd page on this link). Use the symbols and a scrap piece of paper to write the algorithm for one of the images. Have someone else figure out which image your instructions would create. Try it again. Step 3 - How are you doing? Try the Graph Paper Self-Assessment. You don't need the actual paper. Just think your way through each task. Step 4 - Think you understand algorithms? What things in real life require specific steps in a specific order? Add to our collection of real life algorithms! Topic: Explore! What is a computer program? What purposes do they have? Step 1: Explore and play each game on the arcade from the coding club of 2015. As you play, ask yourself: What is effective? What is ineffective? Step 2: Head over to the Scratch Site. There are lots of user-created games there! Play some of them! Also, click on the "See Inside!" link to check out the code that makes them go. Change some of it. What happens?? Step 3: Click this link here. What genres (kinds) of video games are there? Can we compile a full list of game-types? 1. Will I make a Scratch account of my own? Yes you will! Coding doesn't just 'end' when you move away from specific, designated coding time. You may find that you wake up with outstanding ideas, or solutions to your problems. With an account of your own, you can code ANY TIME, ANYWHERE! 2. Do we have to wait for others to finish each module before we move on? No way! You'll be working through these modules at your own pace. When you get through all of them, you'll be able to spend more time coding your own game, about Survival v. Extinction! 3. Why are our games connected to the theme of Survival V. Extinction? If you think about it, almost every game out there on your X-Box, PS4, or tablet are based around the idea of Survival! What do we do in the Coding Club? Adventurous programmers wanted! Can you develop a game of your own, through the lens of Survival v. Extinction!? Follow the modules below (in order) as you develop a game of your own!